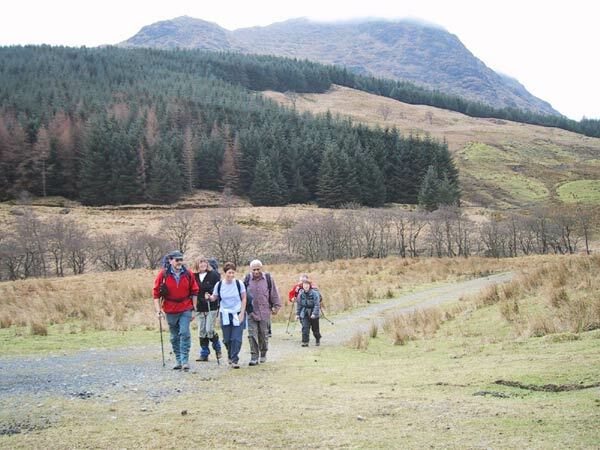 The second low level walk of the year on Sunday was another great success. 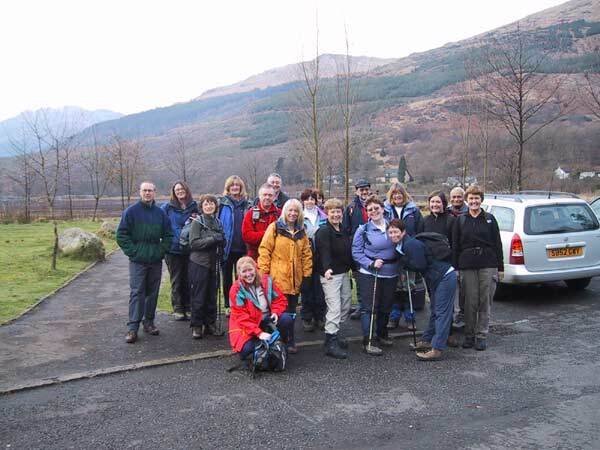 There were 19 of us in total and the plan was to meet at the car park at the head of Loch Long at 11.00am. 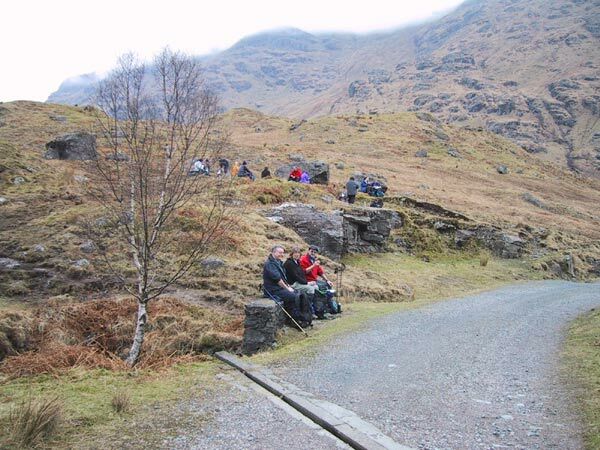 However quite a few of us (nine) bumped into each other at the old church craft/tearoom between Tarbet and Arrochar where we had stopped to fuel up for the day on hot chocolate, cakes and scones (scrumptious). 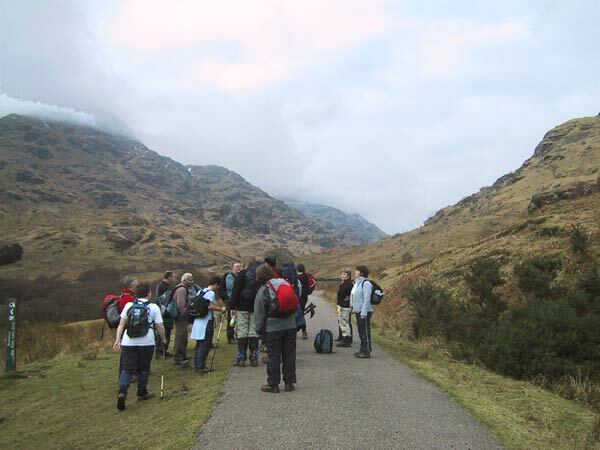 We met up with the others and set off from the public car park at Arrochar around 11.30am. 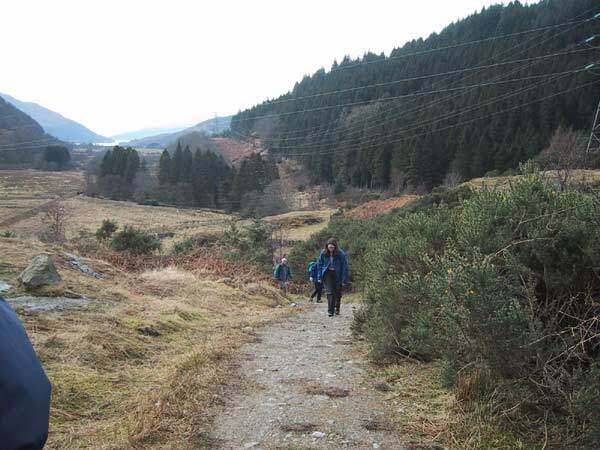 We headed up a track towards Stronafyne Farm following the river upstream, heading alongside woodland up the glen. Once again we were very lucky with the weather and everyone was in good spirits. 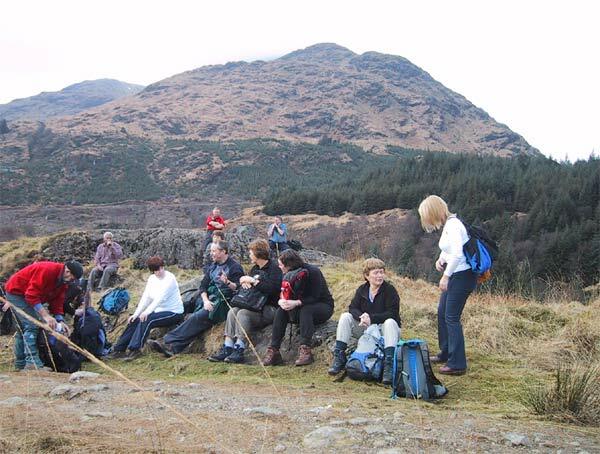 Our first strenuous climb brought us out at a col where we gathered for a wee rest and to savour the wonderful view down to Loch Long. It wasn't long before we were on our way again with another few wee climbs during which Wendy and Lorraine, two new potential members who I had encouraged to come along, were being really friendly towards me waving with two fingers and shouting something like "Just you wait, we'll get you back". We carried on over the bridge at Inveruglas Water onto the tarmac road and followed this up to the next bridge when we decided to look for a nice spot for lunch. 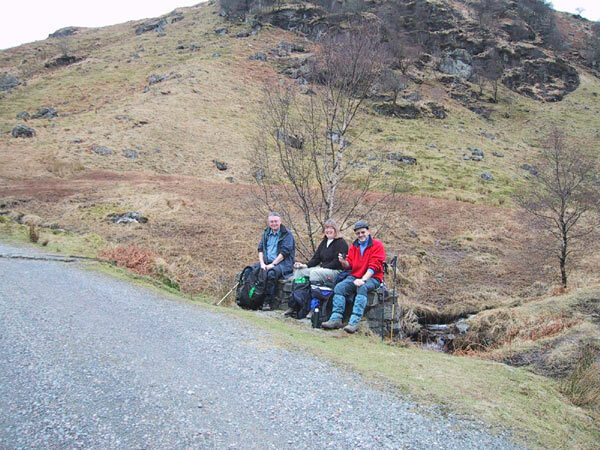 We stopped a short distance along the track and a for a well earned rest and lunch, was enjoyed by all. After lunch we headed up the glen towards Ben Ime. Much to Carol's horror I asked Wendy, who was having a wee problem with one of her legs, if she needed a stretcher. Wendy replied by saying a wheelchair would suffice. However as no walking aids were available (not even a zimmer frame in sight) she gallantly plodded on. 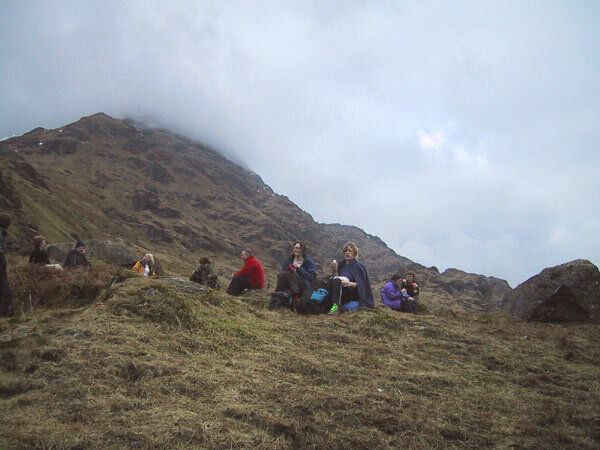 (Carol I hope I didn't put you off walking with us with my weird sense of humour, but never being one to miss an opportunity I was hoping to practice my mountain leader training skills with a make-shift stretcher to get somebody, anybody off the hill). Near the end of the walk we took a steep narrow path down through the trees which we were assured was a good shortcut??? Anyway after a few slips and lots of laughs we reached the tarmac road and headed off to the pub where we met up with most of the high level gang. A big thanks to Irene for organising the walk which everyone seemed to enjoy. Peter, thanks for waiting for us and showing us where the shortcut was - a true gentleman. 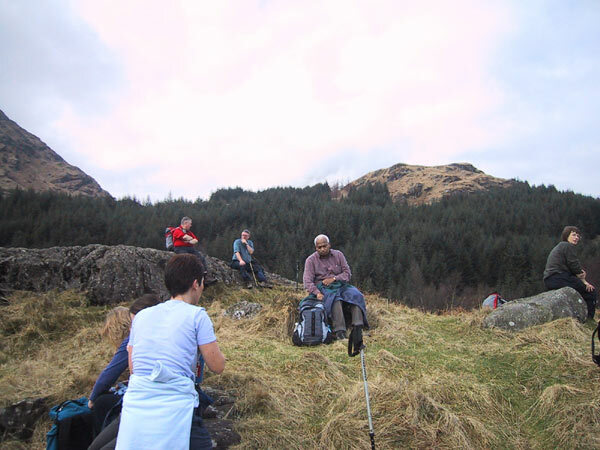 It was good to get the opportunity to spend time with a great bunch of people - roll on the next walk.